The village of Winlaton is an ancient one. It is perched at the top of a hill overlooking the rivers Tyne and Derwent. The Manor house of Winlaton was located at Hall Garth on the north side of the village. It can be safely assumed that the village was a small one until the arrival of Ambrose Crowley in the 1680's. He chose Winlaton as his centre for nailmaking after trying to start his business in the coastal town of Sunderland on the banks of the Wear. It was the expanding Naval fleet and the need for nails of various sizes which prompted this son of a Stourbridge ironmaster to come north to set up his own business to supply this growing lucrative need. In the year 1691 soon after setting up his nail making business at Winlaton to supply the growing demand by the navy, Ambrose Crowley the ironmaster decided to build his own mill for making tools. By 1697 the mill was beginning to produce augers, files, chisels, anvils and `other sundry goods'. In 1700 thatched houses were built for the workers. Mostly these consisted of a building with two main floors and lofts. Rooms could consist of a single space for unmarried men or larger areas for families. The largest and grandest house was that of the foreman of the mill , Thos. Kirkup. The year 1700 also saw the first furnace constructed where steel was to be produced for tipping the tools. The high cost of making steel forced its' use to be limited to the cutting edge of a tool only. In 1703 Crowley decided to add a mill for slitting iron bars to make rods, the raw material for the nailmaker. This was prompted by the high cost and dubious logistics of transporting rods from Stourbridge, his home town. By 1712 the ` Mill' consisted of two `squares', offices, houses for the workers, steel cementation furnaces, and nine great water wheels to provide the motive power. One forge hammer was reputed to have the capability of beating iron at the enormous rate of about 560 per minute. A survey was carried out in the year of 1718. This was completed by a Mr. Warner and showed the mill and the newer works at Swalwell including the river course and all of the surrounding countryside. It was thanks to Mr. Warner that we know who lived and worked at the mill, their occupations and their rents if any that were paid to the company. Around the year of 1724 John Crowley (Ambroses' son) set up a small school and appointed a teacher to instruct the village children. Winter classes between September 29th and March 25th would start at eight in the morning and break between twelve and one 'clock then close at four in the afternoon. Classes during the summer months would start earlier at six, breaking off at eleven for two hours until one o'clock then closing at five in the afternoon. Steelmaking ceased in 1735 and was likely transferred to the Swalwell works. In the same year however filemaking production was increased. For many years coal production was also a major local industry Two waggonways, the `Bucksnook' and the `Westernway' both constructed on the hill above the eastern side of the river Derwent carried the black fuel down to the Tyne past Whickham and Swalwell. In the year of 1739 a new way was opened which ran down the western side of the river valley from pits at Pontop, Hopson, Marley Hill and Byer Moor. The route took a meandering course past `The Mill' and down to staithes at Derwenthaugh taking in an older stretch of way from the Launds Wood area. Known as the Main Western Way or simply the Main Way, until the 1970's, formed part of the oldest stretch of waggonway / railway in the world. Little changed in the area for many years but in 1830 a turnpike road was constructed between Swalwell and the village of Shotley Bridge which lay several miles upstream from the Tyne. A turnpike near to the gates to Axwell Park at the Swalwell end, controlled the northern flow of traffic using the road. Some of the road however used part of the original route of the waggonway which had, in 1810 ceased to be used, though between The Mill and Swalwell the road followed alongside the remaining waggonway. The artist Turner visited the Winlaton Mill area and upon a request from the Bowes family of Gibside painted a scene which clearly shows the mill race dam in the foreground and prominent features of the estate such as the Banqueting Hall and the impressive column constructed in the year of 1750. This was a monument, which stands now as it did then ,over 140 feet high with the statue placed at its' top to represent `British Liberty'. Politically the workers at the three villages of Winlaton, Winlaton Mill and Swalwell were predominently Conservative. After 1816 when Winlaton was abandoned by the Crowley company this changed, with those of Winlaton becoming ardent Chartists. The political scene at The Mill and Swalwell changed little but the working system at the remaining two villages was changed forever. The last remaining member of the Crowley family (Theodosia daughter-in-law of Sir Ambrose) had died in 1782. The business passed into the hands of Isiah Millington one of the company employees. It was when his son Crowley Millington, who closed down the business at Winlaton , died in 1849 that the works lost its' way and direction. In 1850 after being run by Fergus Graham the facilities were sold to a Mr. Laycock. It was this Mr. Laycock who, wanting to rid himself of the practices and customs of over 150 years at the ironworks of The Mill and Swalwell ritually burned the company records and the Law Books which until now had governed every aspect of the mens' working lives. It was in his mind to dictate the terms of labour according to his own will and desire. On February 10th, 1863 the works at The Mill was sold on again for the paltry sum of £780 to a company called Pow & Faucus. The road through the Winlaton Mill area is an ancient drovers road. In 1652 Oliver Cromwells' baggage train made its' way down the eastern slope, known then as Clockinthenns but now as Clockburn, across the ford and up the western hillside towards Winlaton then crossed the Tyne river at Newbourne. In 1842 the supports for the first `Butterfly Bridge' which still stands beside the ford were built by `Lang Jack' English who later entered into politics. A bust carved by John Norvelle of Swalwell now stands in the centre of Whickham as a memorial to his memory. In 1865 progress again caught up with village life when work began on the railway which extended from the junction near Swalwell and ended at Conside. The Iron Company which later became known as Consett Iron Co. Eventually the Mill works passed to Mr. Raine who carried on the business at the Winlaton Rolling Mill as it was now known. As a suitable and fitting end to the working life of the village he lived in the house originally built for Kirkup the first foreman at the mill. In 1815 Raine was forced to transfer his operations to the new Delta Works at the mouth of the Derwent. Twenty years or so later and after many representations to the council at Blaydon there was a new village built to house the `Millers' and the workers needed for the new Coke Works erected between Winlaton Mill and Swalwell. So it was that after 241 years of industrious life, the Old Mill ceased, as a village, to exist. There are few reminders to the past at The Mill. A public house, the Golden Lion, which may have started life as Spencers House in the low close is the last of many. The Poor Brewhouse, the Grey horse, the Royal Oak, all stood at one time or another ready to slake the thirst of the smiths and the travellers who passed by them on their way. The mill race dam, the butterfly bridge, are sadly among the last remaining icons of a life gone by. 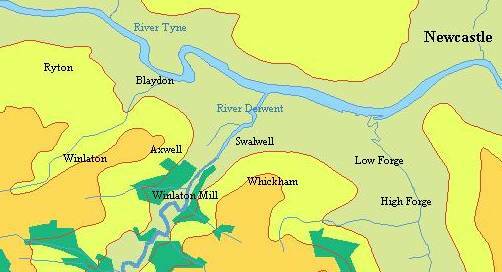 The village of Swalwell like Winlaton is an ancient one. It is situated on the lowlands below Whickham close to the river Derwent and only a short distance from the Tyne. When Ambrose Crowley set his sights on the village there was already a small iron foundry on the site. It was owned by Edward Harrison who sold out to Crowley in 1707. Ambrose cut a new mill race and built a dam about half a mile upstream to gain a steady head of water to power his new works. It was the manufacture of wrought iron anchors and chains for the Navy which prompted this expansion of the Crowley family iron business. Soon the works became the centre of operations in the northeast and the committees which met here held sway over the others at Winlaton and `The Mill' The manufacturing scope of the three factories changed. Swalwell added frying pans and salt pans to its' list. The were furnaces, forges, workshops and warehouses employing hundreds of men. Coal was an easy product to had at this time, the Bucksnook waggonway passed within a couple of hundred yards from the factory. Like Winlaton Mill houses were built for the workers. Soon there was a sizeable village which remains essentially the same today in layout.